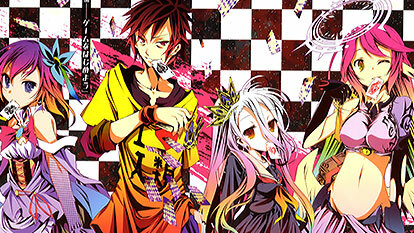 The story of No Game, No Life centers around Sora and Shiro, a brother and sister whose reputations as brilliant NEET (Not in Education, Employment, or Training) hikikomori (shut-in) gamers have spawned urban legends all over the Internet. These two gamers even consider the real world as just another "crappy game." One day, they are summoned by a boy named "God" to an alternate world. There, God has prohibited war and declared this to be a world where "everything is decided by games" even national borders. Humanity has been driven back into one remaining city by the other races. Will Sora and Shiro, the good-for-nothing brother and sister, become the "Saviors of Humanity" on this alternate world? "Well, let's start playing."